It will continually update the gpu usage info (every second, you can change the 1 to 2 or the time interval you want the usage info to be updated). For more commonly used Linux commands, check my other posts at here and here . This post introduces an interactive tool for visually monitoring the memory and process usages of your Ubuntu 16.04 Desktop or Server in real time. Htop is an interactive system-monitor process-viewer and process-manager. It is designed as an alternative to the Unix program top. It shows a frequently updated list of the processes running on a computer, normally ordered by the amount of CPU usage. Unlike top, htop provides a full list of processes running, instead of the top resource-consuming processes. Htop uses color and gives visual information about processor, swap and memory status. Step 1. First make sure that all your system packages are up-to-date by running these following apt-get commands in the terminal. Leave this terminal open, you can use CTRL + ALT + T to open another new terminal for your other work. 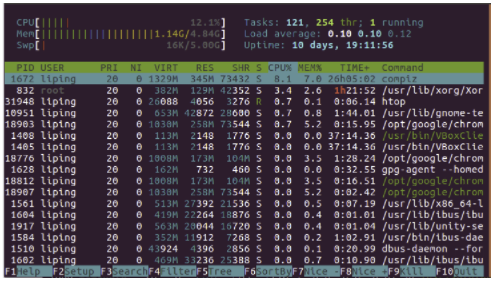 Then htop will help you monitor your memory usage in real-time:) Enjoy! This post provides a brief introduction to tmux and some commonly used commands and useful resources about tmux. tmux is a terminal multiplexer. What is a terminal multiplexer? It lets you switch easily between several programs in one terminal, detach them (they keep running in the background) and reattach them to a different terminal. And do a lot more. One of these features is the ability to break your session into more discreet components, called windows and panes. These are good for organizing multiple varied activities in a logical way. Let’s look at how they relate to each other. Sessions are for an overall theme, such as work, or experimentation, or sysadmin. Windows are for projects within that theme. So perhaps within your experimentation session you have a window titled noderestapi, and one titled lua sample. Panes are for views within your current project. So within your sysadmin session, which has a logs window, you may have a few panes for access logs, error logs, and system logs. 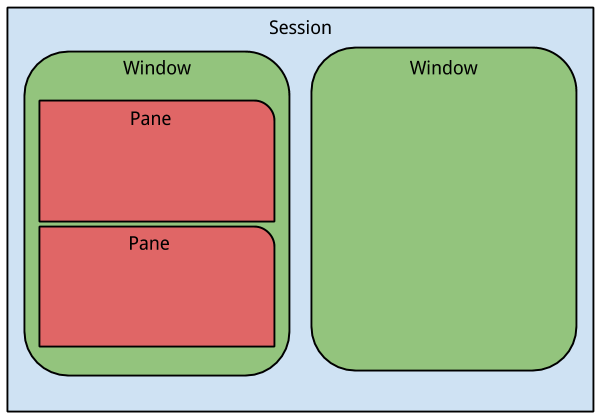 It’s also possible to create panes within a session without first creating a separate window. I do this sometimes. Hopefully it isn’t as horrible as it sounds right after reading about nesting. Can someone explain how they use sessions and windows and panes? It feels like one too many levels, why both sessions AND windows? I’m willing to believe there is a use case, but for the life of me I can’t come up with one. I use sessions for different projects, and windows and panes within a project. For example, I’ll have a session for my puppet code, and a session for a bash script I’m working on. Within the puppet session, if I’m going to work on a new module, I open a new window. If I’m writing code in vim, I usually split off a pane so I can test running it next to it. Having the error output next to the code makes debugging really fast. In a lot of ways, it basically acts like a tiling window manager for the terminal. The advantage over a window manager is that the whole layout can be accessed remotely. So if I’m working on a project from work, I can quickly resume working on the project from my home computer after SSH’ing in and reattaching to the tmux session. By default, tmux uses Ctrl-b as its shortcut activation chord, which enables you perform a number of functions quickly. Ctrl-b (release the keys, and immediately press the “[” key ) the key with “[“. when you see the cursor becomes a solid flashing diamond, you can use arrow key to move your cursor in the active terminal window. Note: Press “q” to exit the cursor move mode. tmux is developed on a client-server model which means that the session is stored on the server and persist beyond ssh logout. Ctrl + D — exit tmux from terminal. Each session can have multiple windows. By default all windows are numbered starting from zero. Ctrl +b, followed by holding down Alt, and using the arrow keys to resize. ======things about how to save sessions and recover sessions. If you reboot you computer you will lose the sessions. Sessions cannot be saved. But, they can be scripted. What most do in fact is to script some sessions so that you can re-create them. Note: check the comments for some up-to-date scripts. This tutorial covers installation of tmux and some commonly used commands. Please read https://raw.githubusercontent.com/tmux/tmux/master/FAQ and tmux man page for more information on this. This post introduces how to find out the number of CPUs/cores on Linux machines from command line. 20 # this means there are 20 cores on the linux machine. This is the method we will cover later in this tutorial. Method #2: Install the bundled Distro-Stable Version Node.js (version 4.2.6) – it is very simple to install, just one or two commands. Ubuntu 16.04 contains a version of Node.js in its default repositories that can be used to easily provide a consistent experience across multiple systems. At the time of writing, the version in the repositories is version 4.2.6. This will not be the latest version, but it should be quite stable, and should be sufficient for quick experimentation with the language. This tutorial picked the Node Version Manager (nvm) based method, because it is much more flexible. Open a terminal (Ctrl + Alt + T), and type the following command. We’ll need to get the software packages from our Ubuntu repositories that will allow us to build source packages. The nvm script will leverage these tools to build the necessary components. First, we need to make sure we have a C++ compiler. Open a terminal window (Ctrl + Alt + T) and install the build-essential and libssl-dev packages. By default, Ubuntu does not come with these tools — but they can be installed by the following commands. #Note that we DO NOT need to add anything in the opened nano text editor window. We just need to create the .sh file. # Use Ctrl+O to save the file, and then hit Enter, and then Ctrl +X to close the file. It will install the software into a sub-directory under our home directory at ~/.nvm. It will also add some necessary lines to our ~/.profile file in order to use it. Now that we have nvm installed, we can install isolated Node.js versions. Each version of Node.js will keep track of its own packages and has npm available to manage these. there are a quite a few ways to get up and running with Node.js on your Ubuntu 16.04 server. Your circumstances will dictate which of the above methods is the best idea for your circumstance. While the packaged version in Ubuntu’s repository is the easiest, the nvm method is definitely much more flexible. This post provides the instructions how to run a Java program from Terminal with external library JAR. When using Eclipse to code Java program, which imports some external JAR library, we can use Eclipse to compile/build/run the program. But if we would like to run our Java program that used External library Jars from Terminal, where should we put those JAR files, and how to build and run the program. Note: cp in the above commands refers to classpath, which is a parameter in Java Virtual Machine or the Java compiler that specifies the location of user-defined classes and packages. The parameter may be set either on the command-line, or through an environment variable. Wild cards were introduced from Java 6. 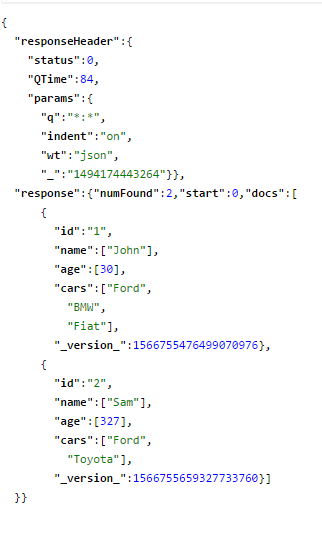 Class path entries can contain the basename wildcard character *, which is considered equivalent to specifying a list of all the files in the directory with the extension .jar or .JAR. If you need only specific jars, you will need to add them individually. The classpath string does not accept generic wildcards like Jar*, .jar, hiber etc. This post provides some notes and useful resources about installing Ubuntu 16.04 on Oracle VirtualBox that runs on your Mac or Windows. Note: check the RAM and hard disk size of your machine before creating a virtual machine on it. For Ubuntu, it is not always a wise choice to pick the newest version. My suggestion is that (unless you are aware that you need to install a particular version), download and install the latest LTS (Long Term Support) version (see the picture below from Ubuntu wiki page). Every two years, a Ubuntu LTS version is released, which will be supported for updates for five years. For example, as of now, Ubuntu 16.04 LTS is the latest LTS version. Memory allocation for your virtual machine. 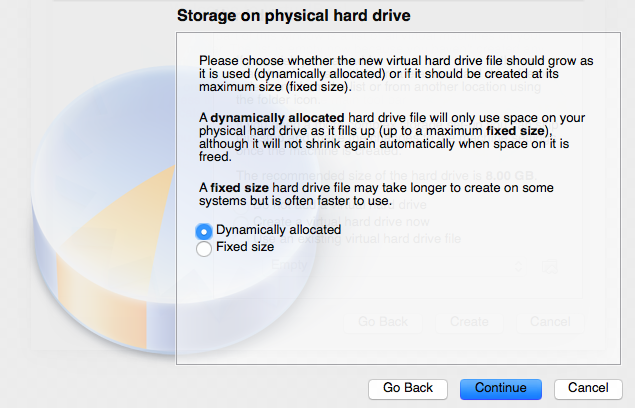 Storage type: Select “Dynamically allocated” if you are not sure how large storage you actually will need. My notes: This one is very good (with snapshots), including Guest additions and Shared folders settings. 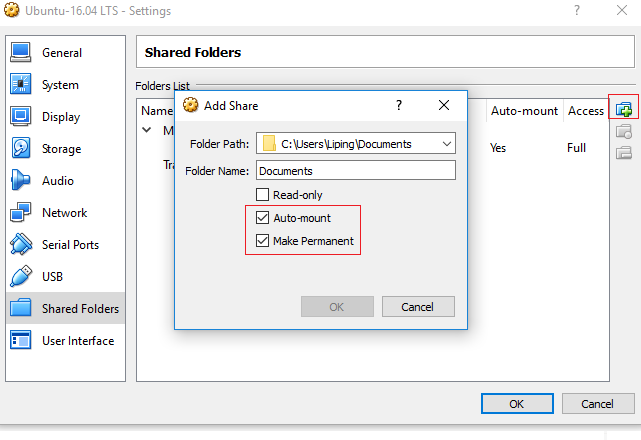 (Note that Guest additions are required if you want to set Shared folder, so be sure to install Guest additions first). sudo adduser brb vboxsf   # Replace 'brb' with your account name on Ubuntu. One more note: Although Shared Folder setting in VM is very convenient, using VirtualBox shared folder directly for fastq data, annotation or output directory can significantly reduce the performance compared to a native (Ubuntu) system or VirtualBox native system, so my recommendation is only use the folder to transfer files between windows/mac and your Ubuntu VM. P.S. If you see some tutorials tell you that you need to enter some command like “sudo mount -t vboxsf sharing /mnt/share” to automatically mount the shared folder each time you start your Ubuntu VM, that is outdated instructions. 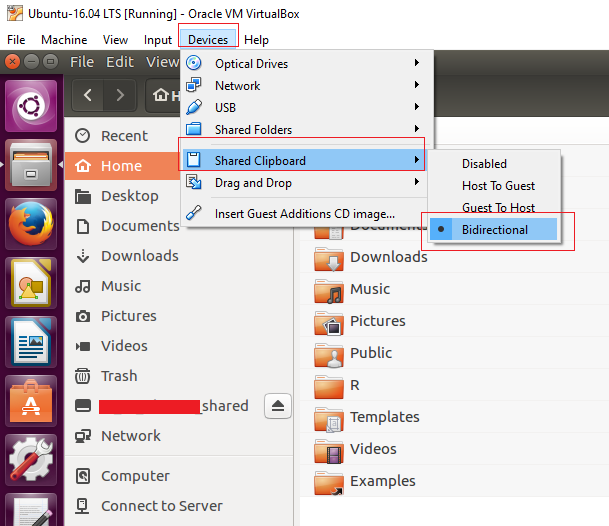 If you want to share the clipboard between your host and your virtual machine, check out the picture below. Q: Do I need to backup my files when I upgrade my VirtualBox to newer version. A: just install the latest version and you will have all your files in the new one. You need not have to uninstall the old virtual machine. My notes: this one is very good (with snapshots) on Mac. My notes above about VM settings running on Windows work the same for VM settings running on Mac. To compile a .java file on Linux (e.g., Ubuntu), first you need to install Java JDK on your computer. You can install it with the instructions at How do I install Java? , here and here. The default port for Solr is 8983, but there are circumstances where you may want to change this. For example, if you wish to experiment with a new release, or you want your various Sitecore development instances to hit separate instances of Solr. See below for two options for changing the port number on Ubuntu. Step 1: use sudo service solr status to check your Solr status and the port it is running on. Apr 30 11:08:42 yourservername solr: Started Solr server on port 8983 (pid=2861). Happy searching! Apr 30 11:08:43 yourservername systemd: Started LSB: Controls Apache Solr as a Service. Step 2: use sudo service solr stop to stop your Solr first before we go ahead and change its default port. May 07 15:40:57 yourservername systemd: Stopped LSB: Controls Apache Solr as a Service. Step 4: Start your solr service again using sudo service solr start, you will see your solr is now running on the new port your changed just now in the step 3 above. May 07 16:11:32 yourservername solr: Started Solr server on port 8985 (pid=17327). Happy searching! May 07 16:11:32 yourservername systemd: Started LSB: Controls Apache Solr as a Service. Now you can reference Step 5: Creating a Solr search collection in my another post to create a Solr search collection for this port. Switching Solr from port 8983 (pdf) — if you are running Solr on Windows, this post might be useful for you. 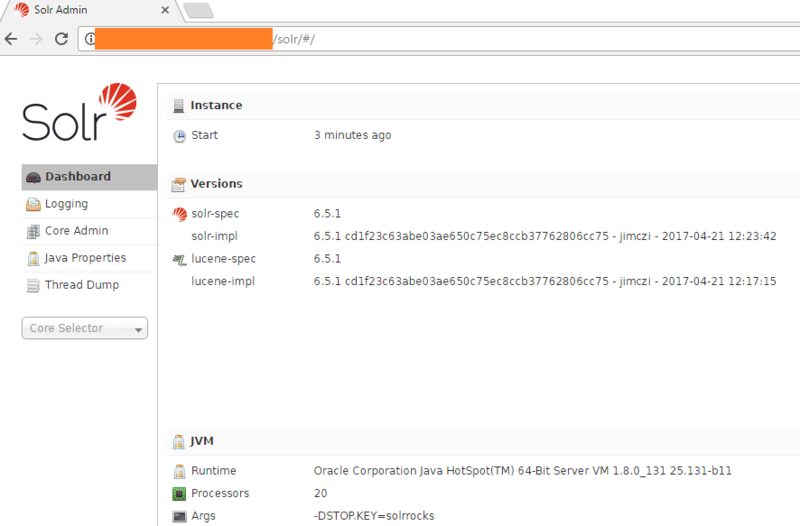 This tutorial will show you how to install the latest Solr version on Ubuntu 16.04 LTS. The steps will most likely work with later Ubuntu versions as well. Before Solr 5, Solr doesn’t work alone; it needs a Java servlet container such as Tomcat or Jetty. But after Solr 5, it does not need to run on Tomcat. Beginning with Solr 5.0, Support for deploying Solr as a WAR in servlet containers like Tomcat is no longer supported. For information on how to install Solr as a standalone server, please see Installing Solr. Things need to do when installing Solr version before 6. Your client would talk to Solr on typically http://host.name:8983/solr/ as a standalone server, not as one out of many webapps on 8080. Apache Solr 6 required Java 8 or greater to run. There had been lots of scaling improvements in Solr 6. Now let’s get started with the installation. Use a non-root sudo user to login into your Ubuntu server. Through this user, you will have to perform all the steps and use the Solr later. To update your system, execute the following command to update your system with latest patches and updates. $ sudo apt-get upgrade -y   #note that this will update your ubuntu OS, skip this if you do not want to update your system. Solr is a Java application, so Java needs to be installed first in order to set up Solr. See my post for detailed Java 8 installation on Ubuntu 16.04. Now Let’s download the required Solr version from its official site or mirrors. First go to this Solr Download page, click the link to the latest version. You would probably see something looks like the pic shown below. Get the download link you prefer. 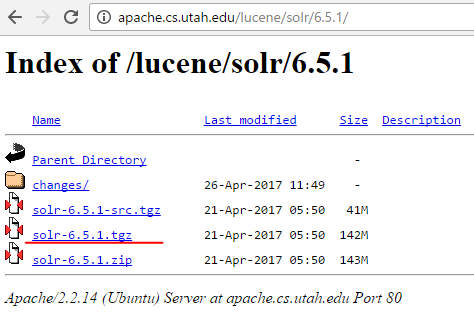 (for my case, I used this one http://apache.cs.utah.edu/lucene/solr/6.5.1). Click the download link you selected, and then you would see something like the pic shown below. Now extract solr service installer shell script from the downloaded Solr archive file and run installer using following commands. Apr 30 11:08:42 myserver solr: Started Solr server on port 8983 (pid=2861). Happy searching! Apr 30 11:08:43 myserver systemd: Started LSB: Controls Apache Solr as a Service. Use the following commands to Start, Stop and check status of Solr service. 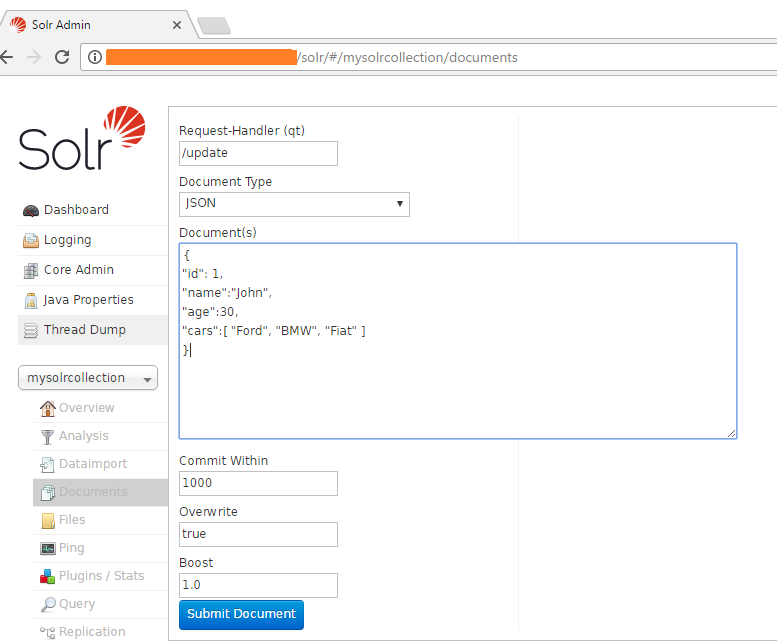 Using Solr, we can create multiple collections. 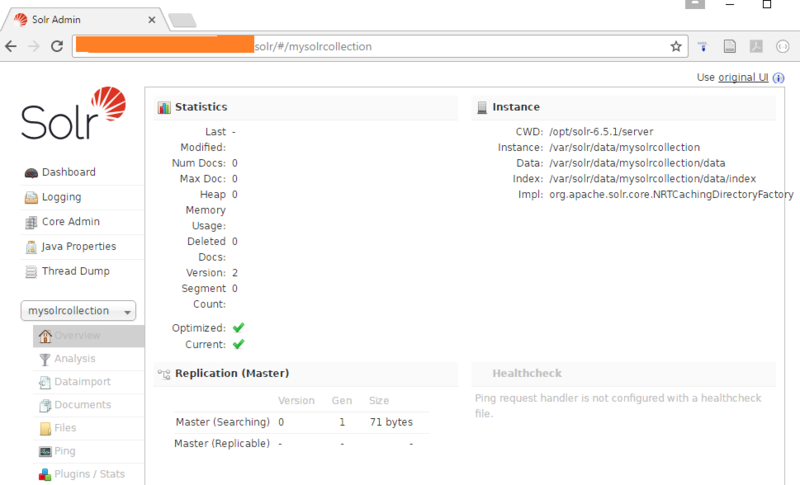 Run the following command, give the name of your collection (here mysolrcollection) and specify its configurations. $ sudo su - solr -c "/opt/solr/bin/solr create -c mysolrcollection -n data_driven_schema_configs"
myusername@myserver:/opt$ sudo su - solr -c "/opt/solr/bin/solr create -c mysolrcollection -n data_driven_schema_configs"
You will see some files shown in the picture below. Default Solr runs on port 8983. You can access Solr port in your web browser and you will get Solr dashboard. The Apache Solr is now accessible on the default port, which is 8983. The admin UI should be accessible at http://your_server_ip:8983/solr. The port should be allowed by your firewall to run the links. Or use your machine’s host name if you have one. Here you can view statics of created collection in previous steps named “mycollection”. Click on “Core Selector” on left sidebar and select created collection. To see the details of the first collection that we created earlier, select the “mysolrcollection” collection in the left menu. Click on the submit document button after adding the data. 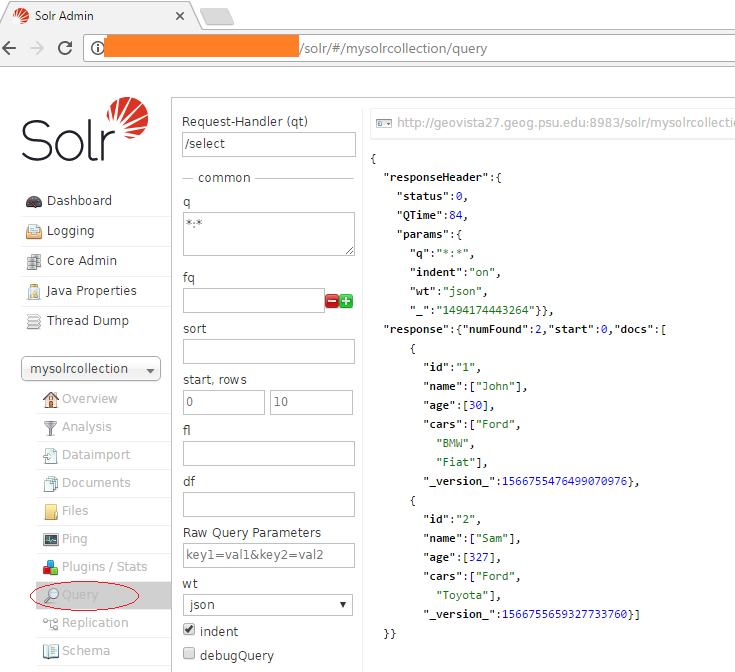 After successfully installing the Solr Web Interface on Ubuntu, you can now insert the data or query the data with the Solr API and Web Interface. 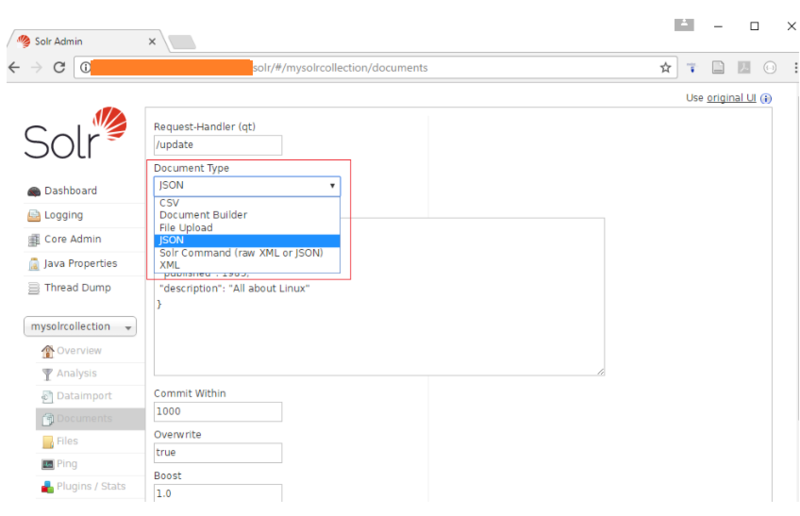 You can write code to add a large set of documents into Solr. See my post for using Solr with Python. See this post for some useful Solr resources I collected. How To Install Apache Solr 6.2 on Ubuntu, Debian & LinuxMint (Aug 27, 2016 by Rahul K.) (pdf) – Nice tutorial. It didn’t say directly in the text, but this will install Solr as a service that auto-starts when you (re)boot Ubuntu. Install Tomcat & Solr (You can’t avoid this one) – This is for Solr before version 5, after Solr 5, Tomcat is not required to install Solr. Also, if you installed Solr manually, open the file core.properties (nano core.properties) and change the name to the same name. Paste your own schema.xml in here. How to start Solr automatically?